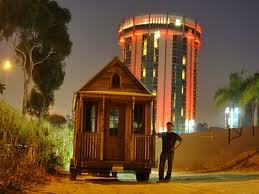 “When I found out that living in a tiny house is illegal, I just had to get myself into one. This is the coziest form of civil disobedience I’ve found. It’s the tiny Trojan horse with curb appeal.” Jay Shafer, Tiny Activist and founder Tumbleweed Tiny House Company. A lumbering Tiny House coming to assist the Wall Street Occupation Forces may be the most important piece of moral combat artillery around. More.